Coast Road. Where life's greatest gifts come to us by accident. Rachel Keats and Jack McGill were artists, deeply in love when they married, until the rush of life took its toll. After ten years of marriage, they divorced and went their separate ways. Jack stayed in San Francisco. Rachel moved with their two young daughters to Big Sur. Six years later, an alarming middle-of-the-night phone call demands that Jack put aside his own busy life and career as a leading architect to rush to his ex-wife's hospital bed. While she lies lifeless, Jack maintains a bedside vigil and finds himself getting to know Rachel better than he ever did -- through their daughters, her friends, and, even more revealingly, through her art. Meanwhile, the beauty and grace of the redwood canyon where she has made their home also work their own special alchemy upon Jack. He begins to see Rachel, his daughters, and the story of his marriage with new eyes. Coast Road celebrates those things in life that matter most -- the kinship of neighbors, the companionship of friends, and the irreplaceable time spent with children and family. 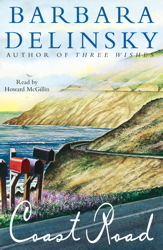 In this masterful new novel, Barbara Delinsky depicts with exquisite accuracy the ties that bind each of us to those people and places we hold most dear. Thoroughly enjoyed this one. It moved quickly and was interesting enough to make my commute go quickly. Just a nice, sweet story. Typical Delinsky. Sweet. Perfectly benign, middle of the road romance. Nothing special, but a nice story. I just can't get into this book. The "plot" is moving so slowly. Maybe the unabridged version is better? Also, the narrator's voice -- he's reading, not telling the story as most do. Maybe I've listened to too many mysteries lately to be patient enough for a relationship story! I really prefer unabridged stories. I believe that I had already read this book, so I noticed the missing parts. Great Book....................Love it!! 5+ stars! !